With 99 percent of precincts reporting, Rahm Emanuel had 55 percent of the vote and has won outright the bid to be Chicago's next mayor. Several media outlets, including WGN and The Associated Press, called the race for Emanuel shortly after polls closed on Tuesday night. 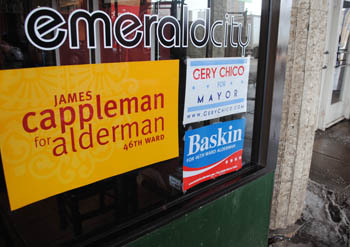 Emanuel needed 50 percent plus one vote to avoid an April 5 runoff election against his top challenger, Gery Chico. Storify: Read social media highlights from the mayoral election. Emanuel's website was updated Tuesday night to thank voters. 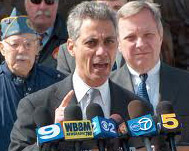 Sun-Times columnist Lynn Sweet gives 10 reasons why Emanuel won. The Red Line Project staff will track social media coverage of Chicago's aldermanic races. Those curations will be linked off this page as results come in.